The resemblance with Pompeii is daunting. It is far harder to write about a large eruption when it is at home. Many of my readers know that Guatemala City is my second home, and that I have my family and relatives there. On top of that this hit’s home harder since my wife is one of the medical doctors fighting to save the lives of cooked children. I have seen images of children with their skin falling off being treated two at a time at hospitals, by doctors knowing that it will not end well. A while ago there was a discussion in here where Albert tried to harmonize the Volcanic Explosivity Index with effusive eruptions like the one at Hawaii. This eruption shows exactly why I do not think it is a good idea to do that, because it moves the focus from lives to energy. And explosive eruptions and the VEI-scale is an attempt at judging how dangerous an eruption is to human lives. And, as we have seen today, even a VEI-3 eruption is far more dangerous to human lives than most effusive eruptions. Fuego is an explosive strato-volcano that has been masquerading as a nice friendly tourist volcano. It has been doing that pretty much non-stop since 1974 when it had its last big eruption. But behind the beautiful strombolian fireworks has always been the potential for far worse. In reality Fuego is deadly. It is a constant threat to the surrounding villages and towns, never far away from hurling deadly pyroclastic flows and lahars down it’s sides. It also has the potential for a catastrophic flank collapse like at Mount St Helens. Earlier today I was asked if there have been signs, and if it wouldn’t have been possible to predict an upcoming eruption. The answer to that question is that we have known for the last few years that the strombolian eruptive phases has grown stronger, and we also know that there has been an increase in seismic signals. What we could not know is that it would come right now. There are two reasons for that. One is that there is not enough equipment around the volcano to accurately forecast an upcoming eruption. Guatemala is just not rich enough to be able to afford such a network. The other reason is that it is always very hard to forecast a volcano that is in a state of constant eruption, like Fuego. In a couple of years, the area will be covered with the most extensive network on the planet, due to MantlePower (a geothermal venture). And they will share the data with the local government agencies. But, even with that network in place it is far from sure that the INSIVUMEH and CONRED could accurately forecast such an eruption, nor is it sure I could. The initial blast sent an ash column 10 000 meters up into the air, that column collapsed and sent pyroclastic flows down the flanks of the volcano into several towns, among them Esquintla. After that came scaldingly hot lahars flowing. After the initial eruption the column height has been around 5000 meters. At this moment this eruption rates as a VEI-3. The firefighters have concentrated on finding living people and not done a search for the already dead. So, expect the mortality figures to climb. Guatemala is a poor country, if you have the ability, instead of sending thoughts and prayers, send money. Preferably via the Red Cross or Medicins sons Frontiers (Doctors without borders). There are a lot of children in need of reconstructive surgery so that they can have a life looking as normal as possible. I really meant the part of many of the children being cooked alive. And with the latest instalment of Edge it seems to be possible to post as usual. Thank you for your thoughts and support Mots! Yes, brings it home how many people in the world are vulnerable, and how dangerous volcanoes are. The steam cloud seems to be getting darker and thicker now. It looks clear with almost no steam now. My guess is around 2am. I did some work on this and lets see if I am close. The latest map from HVO shows that Kapoho has gone. The entire coast is filled in. At least with all the lava now going here, no further damage is being done elsewhere. The waiting for the next M5 is slightly hampered by the fact that the tilt measurement has gone off-line – roght around the level where the previous events happened. Camera is clear though. I missed by 4 hours, not to bad. You missed it by 6 minutes and 38 seconds, not 4 hours. In the long run, what it means is that rather than having to deal with only figuring out what time it is in UTC land, we will have to deal with it on a local basis in day to day business. AND the rest of the nation will keep going out of phase with normal time conversion twice a year. As long as we stay on the same daylight savings routine, at least we keep a standard routine with the rest of the states we do business with. The Florida Panhandle has always been culturally more closely connected with Alabama than the self centered myopic twits in South Florida. Carl, when I heard about the eruption in Guatemala, I thought of you & your wife. My heart just aches hearing about children being so seriously injured. It takes a special person to tend to people harmed in such a horrible way. Your article, I felt was appropriate. Some pictures need to be seen. While it was a terrible thing to see, a lesson is learned. The current eruptions on the Big Island may give some people the wrong impression about their safety. The chats I’ve seen so many had to be told that Kilauea wasn’t the same type of volcano as Mt St Helens. I hate to see people loosing their homes & some their livelihood in Hawaii, but there is a blessing that so far no one has died from it. Here is a good aerial view video, TheCodesearcher dotcom, has of his property. On his property is a huge crack in the ground not far from his house. The lava is filling it. He’s hoping it might help in saving his & neighbors homes nearby. I think he knows though it can go either way. Also, I was wondering how deep “was” Green Lake. Lava filled it & continued on to Kapaho. On update reporting or one of the news sources,(I can’t remember which), they said it was deep. At the time they didn’t have the info. This is over at Noni Farms Rd & Papaya Farms Rd area. It’s where another finger off lava had went off in their direction. It was posted June 6, 2018. This is a bit subject to interpretation. For directly killed, you are correct. Though personally, I feel that the seemingly high number of “suicidal ideation” calls that I’ve been hearing on Broadcastify for the area may be related to the higher level of stress compounding whatever issues the residents may have already been having. Other opinions disagree. (my grandson, and other moderators here). [redacted the David Allen Coe song due to strong language] → The song laments that Jimmy Buffet doesn’t live in Key West anymore. The lava flow as it was earlier today, in the morning in Hawaii. It almost looks like the lava is flowing out of the vent even faster than before, as the channel right at the start of the cone is really moving, probably 50 km/h on that first bit. It is strange how the fountain is lower but the lava effusion rate isn’t, maybe the thermal signals at fissure 9 are from the release of hot gas that is robbing the fissure 8 fountain and causing it to be less high. Perhaps the fountain is choked by the lavapool it is in? That was one of my theories about why higher fountains weren’t observed earlier despite the obvious very high effusion rate, the fountains were being drowned by lava around their bases. The massive 600 meter fountains of 1959 were able to be drowned out by only a few meters of lava, so the fact there is fountaining at all now is impressive, as the active lava flows are likely 10+ meters deep. Regarding 1959 that could have been because the lava there was trapped, while lava at fissure 8 is able to flow away (a long way away at that). I was originally sceptical of this, but after a week of consistent activity it is also possible that the lava now just doesn’t have enough gas in it to cause it to jet hundred of meters in the air, because the effusion rate is probably about as high as it was in 1960 based on the volume now erupted from fissure 8 alone in the time it has been active. Based on information from HVO, the minimum amount erupted from fissure 8 is 84 million m3 if it erupted at 6 million m3 per day for 2 weeks, and a maximum of 135 million if at 9 million m3/day, with an average of a bit over 100 million. 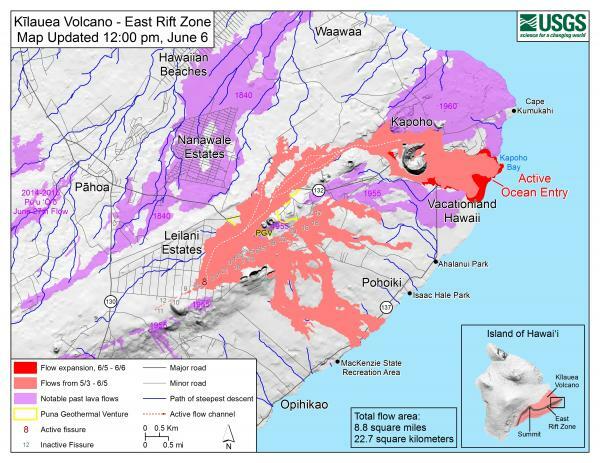 That number doesn’t include the significant amount of lava erupted earlier from more downrift fissures either, so this eruption is well into the big leagues already, bigger than 1955 and 1960, and probably about the same as 1840. Regarding fountain size though, I’m almost certain that one of the fissure 17 fountains exceeded the 200 meter mark just prior to the arrival of new lava, but that was more of a continuous strombolian activity than a hawaiian lava fountain like what is happening now, so I don’t know if that counts. ok, i spent the entire afternoon sitting on my duff at the computer watching the live Kilaeua cam and observed the small plumes aroung the large vent seemed to increase a lot just before the larger ‘eruption’ with the earthquake of 5+ (( told the fam it was for science and i wouldn’t be doing anything else as i was on observation watch ‘for science’ ehehe… good thing they didn’t catch my nap while on observation duty…. 😉 )) It’s lovely being retired. Generally, my dog will lay at the door watching me. If I hear him get up, I know someone is peeking around the corner at me. There are probably a few quakes there to accommodate the load shift. New post is up! Very high up.